See also Chapter 3.6 of Smashing Physics. Last week, on the day we got our first 7 TeV collisions at the Large Hadron Collider, quite by chance we also had the conference dinner of the annual meeting of the Institute of Physics High Energy Particle Physics and Astroparticle Physics groups. After years of financial body-blows to the fields (both principally funded by the STFC in the UK), the LHC news made it a pretty cheerful meeting in the circumstances. The man who headed the UCL high energy physics group when I was appointed to the faculty, Tegid Jones, gave a wonderful after dinner speech. He went through the true and sometimes un told stories around the start up of several big experiments he has been involved in. These included a water-filled proton decay detector in a salt mine (IMB) which initially leaked (dissolving quite a lot of the mine and almost drowning the thesis of a future congressman), then achieved a 300m 490m siphon effect with a cesspit on the surface (bad for optical purity of the water). After the third filling, they failing to find proton decay. 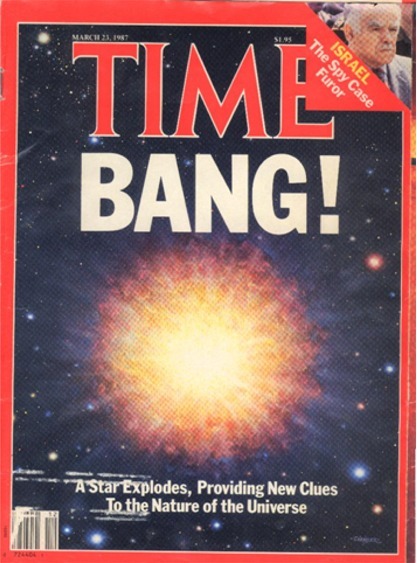 However, they did observe neutrinos from Supernova 1987a – still the only observation of neutrinos from outside the solar system, at least until maybe ANITA spots one. It also developed a lot of the techniques taken forward by the experiments which eventually found neutrino oscillations. I’m lucky to have been involved in the start of two major particle physics colliders. I was a student on the ZEUS experiment, on the HERA collider in DESY, Hamburg, when it began operation. In the first year of my PhD*, data-taking seemed a long long way away. Life consisted of unintelligible FORTRAN code, meetings full of acronyms, and schedules that slipped a month every few weeks. The ZEUS UK software meetings, like (I am told) war, consisted of long periods of boredom followed by sudden violent conflict. I was even driven to drawing cartoons. In the one below, while several senior colleagues get all excited about obscure software, the ZEUS Central Tracking Detector (the main UK contribution to ZEUS and essential for all the physics – a phrase we had tattooed onto our foreheads to impress the grant panels) was leaking gas and looking like it might never work. WARNING: Contains rude words! Do not enlarge if you don’t like rude words. HERA started late, and more slowly than planned, and the ZEUS tracker was missing a lot of electronics when we began. However, in the end the tracker worked brilliantly for 15 years. ZEUS (and H1) produced the best information we have on the internal structure of the proton, and made major advances in our understanding of the strong interaction (QCD). The LHC has also had a stuttering start, of course. ZEUS had about 400 physicists signing the papers. Over 2000 signed the first LHC papers. I was asked by David Colquhoun (a UCL Colleague, in Life Sciences) apropos the LHC: “How do you folks make a reputation?”. A good question which gets asked a lot, by us, by funding agencies and by interview panels. Mostly, the answer is that 2000 people is one big peer group. People in there will know who does what, who really contributes and who doesn’t. References count, as does authorship of important internal notes, often accompanying the collaboration publications. Working hard and well in a collaborative environment is at a premium, primadonnas and timewasters get quite widely known as such. Actually this is part of what makes particle physicists employable elsewhere too, according to several friends in industry. Our author lists are long and alphabetical. We discuss trimming or ordering them every now & then, and always we conclude that it would at best waste even more time, and at worst break the experiment. We already have far too many meetings, rivalries and resentments. It’s not perfect, but it works, and we haven’t thought of a better way yet. The author list is a tangible expression of the fact that we are, all 2000-odd (and yes, I mean odd) egos, in it together. We need that kind of solidarity when things go wrong. And when they go right, eventually. * yeh, yeh it was a D.Phil really. Oxbridge. Go figure. 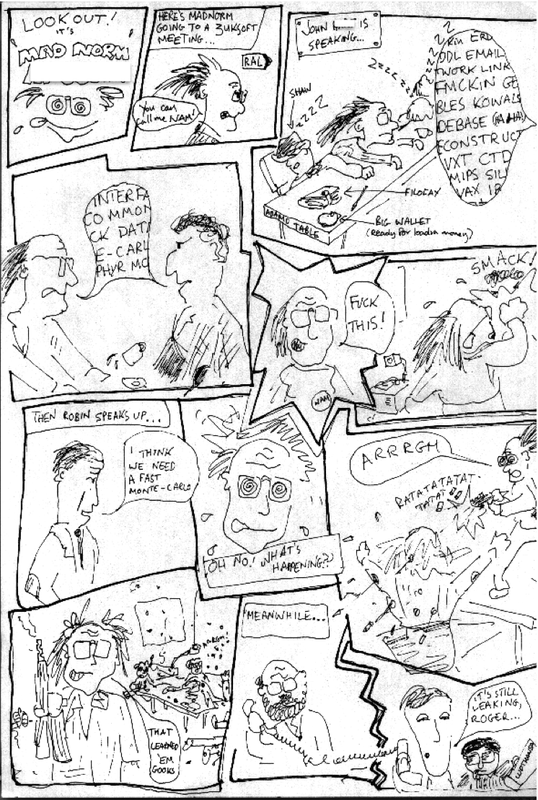 This entry was posted in Particle Physics, Physics, Physics Stories, Science and tagged comics, DESY, LHC, Smashing Physics, STFC. Bookmark the permalink.